Belt bags for the traveller and pouch bags for the indivual highlight the resilient and hard-wearing feature which leather goods inherently imply. A selection of common shapes and styles are presented here. 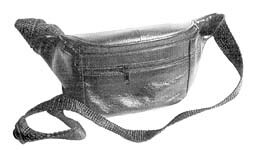 A small size waist bag, 13 x 20 cm. It has a small zip pocket in the front and a main zip pocket with one more zip pocket at the back. Webbed fabric belt and the FF lock allow it to cling to your waist. It is normally made from soft cow leather. 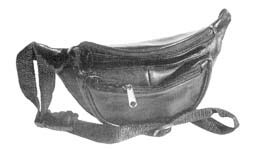 This waist bag is a typical traveler's companion. A must if you are on the beach or sightseeing. It has two zip pockets in the front and one at the back. With the help of a webbed fabric and the FF lock system, it can become a part of you. The size is 23 x 15 cm. It is normally made from soft cow leather. Another Men's bag, extremely convenient to carry and you can also slip in your digital diary. The size is 22 x 14 cm with two gussets covering 7cm. The front has a flap pocket with a side zip. 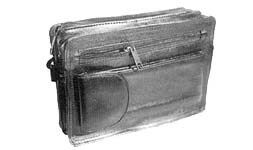 There is another zip pocket at the back and two zip partitions on the top. This design is suitably made in any type of leather. 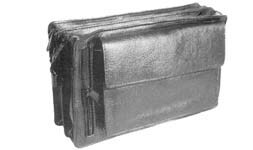 Convenient leather Men's Pouch Bag of size 21 x 14.5 cm with a width of 8 cm. One side has a pocket for spectacles plus a zip pocket. The other side has another side pocket. There are 2 zip pockets on the top. 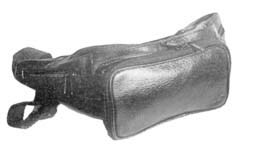 A strip of leather allows your hand to slip through and grip the bag.